The cheque's in the post. I'm still at the office. That looks great on you. Lies make the world go round. And in this book the Would I Lie To You? team celebrates the fine art of the everyday fib. Rob Brydon is back in the host's chair for the sixth series of the hit comedy panel show Would I Lie To You? and as ever, David Mitchell and Lee Mack are the lightning-quick team captains. 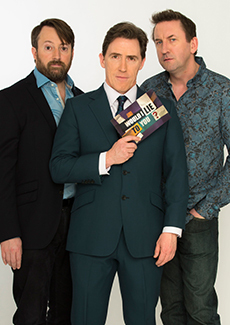 Rob Brydon is back in the host's chair for the fifth series of the hit comedy panel show Would I Lie To You?, and as ever, David Mitchell and Lee Mack are the lightening-quick team captains. Based on the hit BBC comedy panel show, this is a game of quick thinking that calls for a cool head and poker face! Fourth series of the popular panel show hosted by Rob Brydon, with team captains Lee Mack and David Mitchell. Comedy panel show where contestants have to bluff about their deepest secrets. Includes the 8 episodes of Series 9, plus Christmas and 'unseen' specials.